Who does not like having a beautiful well shaped body, especially when summer is coming. There are various options you can go for in order to obtain a well-sculpted body. First of all, there are gym clubs that you can join and use their equipment for a monthly or annual fee. Then, you can jog outdoors. Besides the obvious physical benefits, it has the advantage of being free of charge. For those who want to work out in the comfort of their own home, stores sell all sorts of fitness equipment. 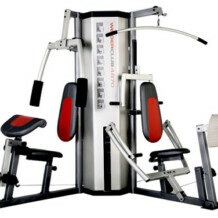 The first criteria you have to take into consideration when choosing your exercise machine refers to your objectives. Do you want to lose weight? You just want to be in shape? Is your aim building muscles mass? Which parts of the body do you want to work on? Do you plan to use the machine for addressing a specific medical issue? These are the questions you have to ask yourself and answer before you make a purchase decision. The category of machines that are working all or most of the muscles of the body include devices such as the spinning bike, the elliptical bike, the treadmill, the apartment rower, the cross-country ski machine, etc.